I’d rather teach an octopus to put on pants. Potty training a Chihuahua is HARD. If you’re here for troubleshooting, you’re not alone. There are some ways that you can make this process a bit easier. It starts with understanding the nature of your itty-bitty companion. A health issue could be causing your dog to be incontinent. Early spaying often causes urine leakage, especially on bedding. Spay incontinence happens to about 5% of small dogs who are spayed before their first heat. Urinary tract infections can cause frequent urination and incontinence. If your dog is peeing a lot, or has any sudden, unusual urinary-related behaviors, a quick urine test can rule out a UTI. A female dog’s urethra is shorter and wider than a male’s, allowing bacteria to enter the bladder, though males can suffer from a UTI too. If you’re having trouble with potty training, talk to your vet to rule out an underlying health issue. This is even more crucial if they were once trained, but are suddenly having accidents again. All dogs are sensitive to punishment, even if that’s just raising your voice… even if it’s an unintentional exasperated sigh when you have to clean up yet another puddle. 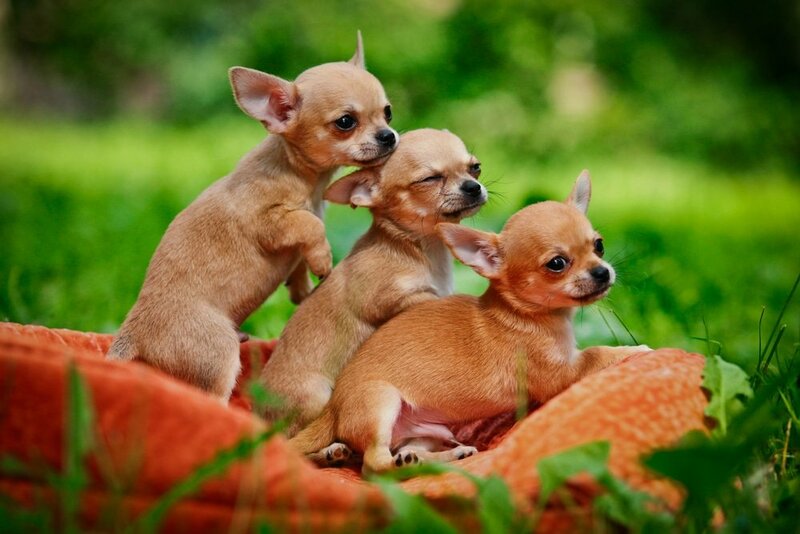 Chihuahuas are especially sensitive to any anger or annoyance you might have about potty training. They can even become frightened if you celebrate too loudly when they finally poop outside. Once they become fearful about going potty, they will hold it in when you’re near, and then wait until they can sneak off. It can help to use a longer leash, or two leashes clipped together, so your Chi can have a bit more privacy when you’re out on a walk. Only use a long leash in an open area, as you may only be allowed a 6-foot leash when you’re at a park. Reel in your long leash any time you’re near a road. Face it, if you’re on this blog post, there’s a 99.999999% chance that there’s a dried pee stain or poop nugget in your home that you don’t know about. Lingering scents attract your Chi, and she’ll continue to soil the same area again and again. Use an enzyme based cleaner like Nature’s Miracle to break down the stain and get rid of the scent. Add your Chi’s scent to the correct potty spot by depositing her poop or a paper towel soaked in pee wherever you want her to go. You can use baby gates and crates to limit your Chi’s free range of your home until you can trust her. I really like the puppy gates from Carlson’s Pet Products because of the walk-through door. Smaller dogs have a larger ratio of skin to insides. With more surface area in relation to their overall size, they get cold more easily. You might start to have a few accident-free months through the summer, only for your Chi to start having accidents again in the winter. You can teach your Chihuahua to poop outside in the winter, but in the meantime, you may want to consider using puppy pads when it’s cold… especially if you know that you won’t be able to walk your dog as often, or supervise her outside to make sure she does her business before you let her in again. I will never cease to be amazed at the size of Matilda’s poops. For her size, they’re long and thick, and sometimes the land sticking straight up out of the ground. Your Chihuahua has a tiny digestive system to match their tiny body, though they have a huge appetite. What goes in must come out. That tiny bladder and small intestine work extra hard to hold in all of those wastes. There’s not really any science on this, but it’s anecdotally evident that Chihuahuas are just physically disadvantaged when it comes to being able to hold their #1 and #2s than larger dogs. As they get older, they will get better and better at holding it in. But that might take longer than you expect. Crate training can help your Chihuahua learn to hold it so those muscles will strengthen over time. It took a while for Matilda to learn how to “talk” to me. Maybe because she was pad-trained. 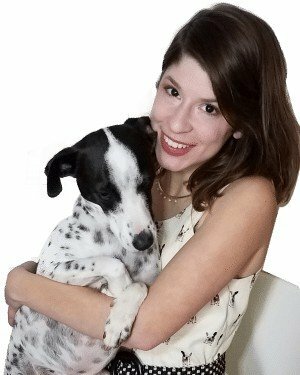 When your dog is pad-trained, they handle bathroom matters on their own, they’re not accustomed to asking to go potty. If she never seems to show any sign that she needs to go potty, it can help to teach your Chihuahua to use potty bells. Remember, your Chi is not being spiteful when she pees or poops where she shouldn’t. Dogs don’t know that we find pee and poop to be yucky. She might pee or poop on your bed or in a pile of laundry because these places smell so strongly of you, so she may be drawn to those places and add her own scent. So many people give up on their Chis. Don’t give up on your Chi. Kiss that round, beautiful noggin. Kiss it. … it’ll all be worth it. You’ll be ready for bigger things. Bigger adventures. Bigger goals. You’ll forget what it was like to have a messy little puppy, and you’ll have a tiny near-human hairy alien creature that has bonded so closely with you that you’ll practically think the same thoughts. Why Does My Dog Carry Food Away From Her Bowl To Eat It? Is this a video? Do you have videos on how to train your Chihuahua? 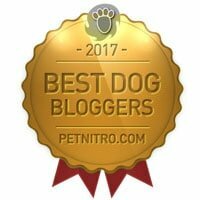 I have a Chihuahuas but I don’t really know how to train him, I read a lot of articles (yours as well) but not getting the idea. It will be really appreciated if you could make a video series on how to train a Chihuahuas. Freddie Johnson recently posted…Should You Wake a Sleeping Dog? What’s your little guy’s name? Is there anything in particular you’re working on? I’m shy about making videos but I want to try it out in the future.